When Derbyshire look back on the 2017 season, it will be the T20 campaign that will stand out and for one player in particular it was a memorable one. 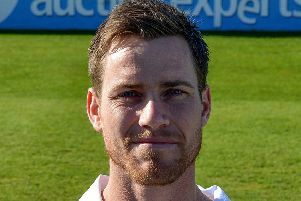 Wayne Madsen’s 526 runs in the competition was a Derbyshire record and included four half centuries plus five other scores of over 30. He also took 13 wickets with his off spin at an economy rate of 7.36, figures which were recognised this week by the Professional Cricketers’s Association. The former Derbyshire captain finished top of the PCA’s Most Valuable Rankings in the NatWest T20 Blast which reflects the work he has put in to become a success in the shortest form of the game. “Certainly when I first arrived I wasn’t really seen as a T20 player and admittedly I probably wasn’t good enough so I had to adapt and find a way to contribute and score quick runs,” he said. “I’m just delighted that I’ve shown the consistency that I’ve probably threatened to show over the last few years and haven’t quite done so but this season I’ve taken my chances and scored the runs. “It’s gradually adapted through playing but also training and practice and trying different shots. Madsen’s hockey background, he represented South Africa and coaches locally, has also helped his advancement in T20. “It definitely helps, especially against the spinners being able to sweep and reverse sweep, for me it’s a big help but I’ve still got to be able to hit the ball out of the ground straight and I’ve done quite a lot of work on that over the last couple of years and that’s helped my game big time. Despite being taken for 16 by Shahid Afridi in the first over of the quarter-final against Hampshire, Madsen enjoyed his role as opening bowler. “I’ve loved bowling in the powerplay, it gives me a great opportunity to take wickets, that’s the way I look at it, they’ve got to take the risks against me, I’m bowling to hit the stumps and if they miss I’m taking wickets.